The Patriot missile is a highly technical piece of equipment that requires an entire team of soldiers to operate. The system has a power plant, a communication relay group, a control station and launching station. The Patriot Fire Control Enhanced Operator is military occupational specialty (MOS) 14E, and it is part of the Army's air defense artillery team. As part of the Patriot missile team, soldiers in MOS 14E have specific technical duties that are part of launching the missile system. They include initializing and operating the Patriot's information and coordination center, its engagement control station, its radar set, and the antenna mast group. Part of the job involves maintaining and conducting preventive checks on the Patriot's fire control section and related equipment, an obviously important part of the job dealing with delicate parts of the missile system. These soldiers also evaluate target data and then identify and engage targets. They'll also perform operation and intelligence duties on the Patriot's fire control section. MOS 14E also provides technical guidance to lower grade personnel. This is not an exhaustive list of the duties of MOS 14E, but this list provides insight into how complex and technical the various jobs involving the Patriot missile are. 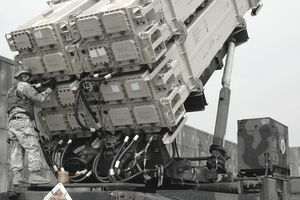 Soldiers in this role need to be able to focus for long periods of time on detailed parts and machinery so that the missile system is always in top working condition. Job training for a Patriot fire control enhanced operator requires ten weeks of Basic Combat Training (otherwise known as boot camp) and 20 weeks of Advanced Individual Training (AIT) with on-the-job instruction. As with most Army jobs, part of the training period is spent in the classroom, but since this job will deal with missile systems, recruits for MOS 14E can expect to spend a good portion of their training in the field, often under simulated combat conditions. The training takes place at Fort Bliss in El Paso, Texas. To be eligible for this job, a soldier needs to be able to qualify for a secret security clearance. This involves a background check, and some past criminal activity, especially drug-related offenses, may disqualify candidates from this clearance. You'll need a score of 104 in the mechanical maintenance (MM) area of the Armed Services Vocational Aptitude Battery (ASVAB) test, have normal color vision (meaning you can't be color blind) and have to be a U.S. citizen to make the cut for MOS 14E.